Due to CRCT testing in nearby classrooms, I had to try to find a way to get my kindergarten and 1st grade class to work SILENTLY on Friday; a feat not easily accomplished with the specific classes I had this past week. My idea - weaving! Weaving requires a certain amount of concentration and I knew it would be an activity that would keep my kids busy and focused. 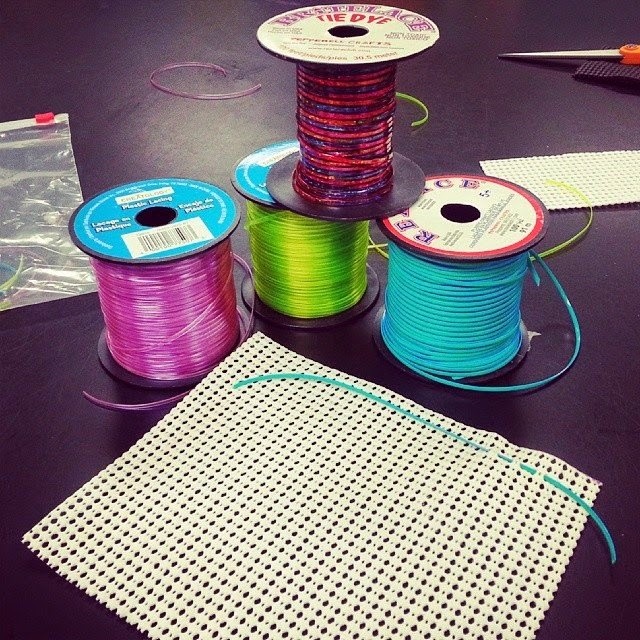 I have a weaving center in my classroom made up of pieces of shelf-liner and rexlace. Normally when students use this center they practice their weaving techniques, then have to put everything back at the end of class; it's not a center that you get to take stuff home from. So when I passed out small pieces of shelf-liner and rexlace on Friday to each students and told them that if they worked quietly I would let them keep everything they wove - they. were. SILENT. NOT A WORD. It was a beautiful sight -- each kid working so intently on their weaving. So inexpensive too! AND it comes in so many different colors! Great idea! The next two weeks are test weeks in my buildings. I think I'll give this a try! Where do you get your lacing materials? Wal-Mart. They have a ton of different colors of padded shelf-liner.. and I think you can also get the rexlace there as well (but I bought mine at Michaels).